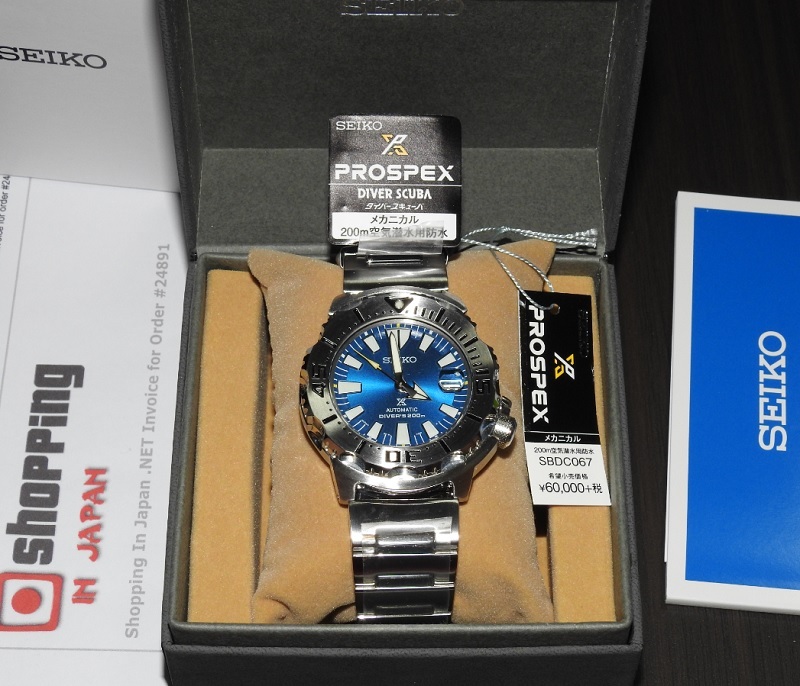 Buy direct from Japan for this 2018 Seiko Prospex Monster SBDC067 Blue Coral Reef edition that comes with Hard Rex with cyclops len, 200m Waterproof for diving, and has +25 seconds -15 seconds accuracy per day. This Prospex SBDC067 is a JDM (Japanese Domestic Market) watch model and it's now in our stock - ready to ship within 48 hours to any country. So buy now before it’s too late! Delivered on time and packaging was excellent. The watch looks great. The only downside was the 20% purchase tax for delivery to the UK. Incredible watch. I also ordered the new orange monster after receiving the blue corral monster ! Thank you Sara for being patient and making sure my watch got delivered. Thank you, once again, Shopping In Japan, for fantastic service and a great watch. I am really enjoying this Monster! Really nice blue/yellow combination. I received this watch in the U.S., from Japan, one week from time of purchase. Amazing! This is my third purchase, and I have not been disappointed at all. Thank you again! Great email communication from Sara. Fast Shipping. Love the watch. Will buy from again. Great gen 3 monster from great company. Always a pleasure to buy. This new Coral Monster is the most vibrant and dynamic blue I have ever seen on a watch, it is almost electric. The fit and finish on this piece is also excellent. It wears much smaller than the measurements might suggest. It is an absolute treat to look at all of the sharp crisp angles and unique shapes. This watch was the first purchase I made with Shopping in Japan and it certainly won't be my last. Hand typed email confirmations and monitoring of my shipment without me even asking was a pleasant surprise. No other businesses had employees following up post purchase during transit, it was a nice human touch. The watch was packaged with great care and arrived unharmed as well. The blue colour is richer than I imagined it to be, as I had expected the colour to be a lighter blue. I would like to add to my last review, that my business experience with Shopping with Japan has been 5 Stars from start to finish. As professional as it gets, and I highly recommend Shopping with Japan for the best service and value, straight from the Motherland where there fine products are made. Shipping to the USA was perfect, safe, secure and quick with no issues, you will be glad you did business with Shopping in Japan. The " Time Bandit "
The Best Yet ! This Seiko Monster is so fine and supremely sweet words alone will not suffice. The details are exquisite and the Blue Coral dial radiant and a joy to look at, and the date cyclops magnifier is ground and set perfectly aligned for a quick and easy view of the date. All the looks and feel of the Original 1st Gen Monsters but upgraded with the super nice 6R15 Caliber movement and a 2nd Gen lightly knurled stem, the dial face being almost identical to the 1st Gen Monsters. This model is destined to become one of the most sought after Monster's as time ticks on. A must have for all Monster collectors and Seiko enthusiasts. 5 stars Seiko keep them coming ! The " Time Bandit "